We Admit It! Committee is moving along well. In fact we have more behind us than in front of us. We’ve enjoyed digging back into reading season and laying the foundation for the Class of 2018. We’ve also enjoyed numerous snacks (the fruit snacks have been devoured, the Cheeze-Its are half-way gone, one bag of frosted animal crackers has come and gone and multiple cookie packs, chip packs, granola bars and candy bars have been consumed – for those of you concerned for our health, the bag of dried fruit is also empty). For the last “Overheard in Committee” blog from the 2013 Early Decision review, we thought we’d address an often discussed Committee topic. Overheard in Committee today: That’s an impressive upward grade trend. We were discussing a student who had improved from mostly Bs in 9th grade to all As in 11th grade. In GPA terms he had earned a GPA of 3.4 (weighted) in his freshman year and a 4.3 weighted GPA for his junior year. That’s a significant improvement to say the least. And his grades continued to improve as the course work got harder (he had only a few honors classes in 9th grade when his GPA was the lowest but had all honors and AP classes in 11th grade when he earned his best GPA). With grade trends, we’d much rather see them on an upward trajectory than a downward one (that probably goes without saying). Oftentimes, outlier grades or significant blips in an academic record are accompanied by an explanation. However, many upward and downward trends are not (which is perfectly fine). In the case of upward trends we generally assume the earlier low grades are due either to the transition to high school and/or an underdeveloped work ethic (the increased work ethic tends to come with increased maturity which is a natural part of development during high school). Downward grade trends are most often caused by the transition into more challenging courses and the accompanying workloads and increased teacher expectations. Some students will dip initially and then rebound, others will continue the downward trend year after year. What we’re evaluating here is a student’s overall work ethic and achievement record and whether both are at a level that will allow them to be successful at William & Mary. And of course we’re comparing those with both upward and downward grade trends to those who have maintained consistent academic records (remember, there are students who have demonstrated incredibly strong grades throughout high school). Of course, grades/grade trends are just one piece of this puzzle. Sometimes those with upward trends may have great other qualities (standardized testing, extracurricular activities, academic potential, intellectual curiosity, etc.) that help to balance the less stellar early grades. Likewise for those who have slight but not worrisome downward grade trends. At the end of the day, what the Committee is considering is whether we believe the student has adequately prepared themselves to be successful academically at W&M and how that student compares (both academically and personally) with the other great students applying for admission. With that, we will head back to Committee (these decisions won’t make themselves after all). We wish everyone a wonderful holiday weekend and look forward to being in touch in December. PS: We know Early Decision applicants are eager to receive their decisions. While we do not have a release date as of yet, we do know that decisions will be released after December 1 (in other words at some point after the Thanksgiving holiday). We continue to appreciate everyone’s patience as we make our way through the review and Committee processes. This blog has been pretty relieving to me, thanks W&M! However, I still have not received an email saying my application is complete…should I be concerned? I received the confirmation but not the second one. I really appreciate the “Overheard in Committee” blog as it helps alleviate some of the nervousness of waiting for an admission decision. One quick question: I was a straight-A student but I got a few B’s this year, and I know I have to send a midterm report if I get accepted or deferred. What is your policy on the downward trend a student’s grades have to show in the midterm report that would lead you to retract the offer of admission? @Jenna, students who applied Early Decision should have heard from us (with a few exceptions) either letting them know what we’re missing or that they are complete. Have you checked your spam and junk folders for the second email? @Bezi, our offers of admission are contingent upon continuing to uphold the high standards of academic and personal conduct under which you were admitted. Getting a few Bs certainly doesn’t endanger that. It’s when there is a more drastic change (either in grades or personal standing) that we may follow up with the student. I also have only received the first confirmation email, and have not heard anything else since, I am applying as a transfer student though… is there something wrong? My son also applied ED and received the first email, but not the second. His spam folder is clean. When should he officially be concerned? Excellent writing, really enjoyed it! My son also applied ED and received the first email, but not the second. He actually opened a new email account just for W&M, and he does not have anything in the spam box. We cannot help but getting worried. @Phil, we are still processing transfer applications so no need to be concerned. @Richard and @ConcernedMom, as long as your students got the initial email there’s no need to worry. We know they applied and will follow up with them to ensure we get a completed application. We are closed for the holiday now but feel free to follow up with us by phone when we re-open on Monday. Best guess is that the applications are complete and the email either accidentally got deleted or somehow lost in cyberspace. Is there any way I could hope for the release of transfer decisions by the December 6th? 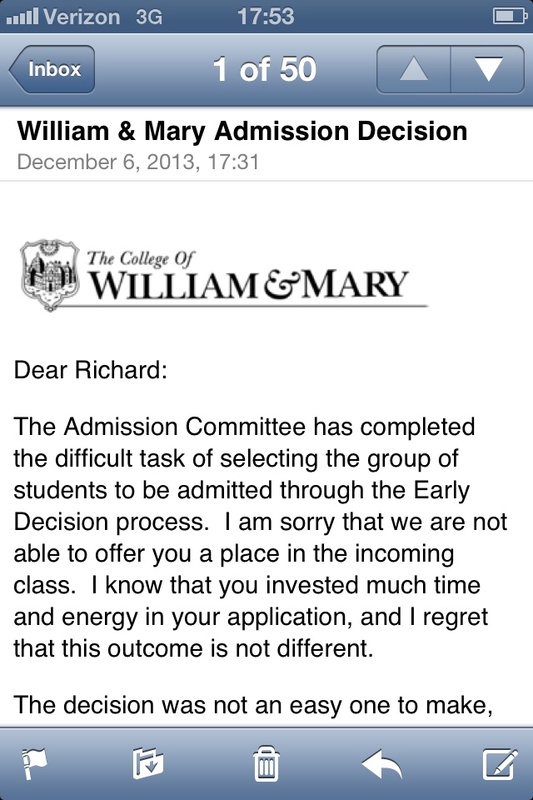 William and Mary has been my number one, but the wait is putting a lot on my shoulders. I’ve got accepted to another school and their deadlines to lock-in are soon, so if the transfer decisions are released late, then I would lose the opportunity to attend any other school if I wait for William and Mary’s letter. I’ve received letters from other schools in the middle and end of October, so I’ve been sitting neutral for a while waiting to hear from you guys. I already surrendered my opportunity at one school, since their deadline has past, and now I have one other school with a deadline approaching. I can imagine how much work admissions has at their feet, but I thought I’d voice my concern. As a first generation college student it’s difficult managing all of this and trying to execute a smooth transition, since my parents are learning right along with me. @Brandon, it’s highly unlikely that we will release transfer decisions by December 6 as we’re not yet done with Early Decision and we complete that process first. We do understand your situation and urge you to contact the other schools who have admitted you and see if you can get an extension on the response deadline. We would likely grant an extension in a case such as yours and they might also. Will all Early Decisions be released on the same day (e.g. December 3rd) or will they roll out gradually after the deadline of December 1st? @Buckminster, we release all decisions for those who applied ED (assuming their application was complete) at the same time. Will decisions be emailed tomorrow? @Charles, we addressed this in the blog’s PS section. We don’t have a release date yet but we know it will be after December 1. How many applicants were there in the early decision pool? @Charles, since we’re still in the process of completing some ED applicants we don’t want to release any final numbers. We are up a few percentage points from last year’s ED numbers but nothing drastically different. Every time my phone buzzes I swear my heart skips a beat. It’s so exhilarating and yet so nerve racking to await a decision that will have so much impact on my future. 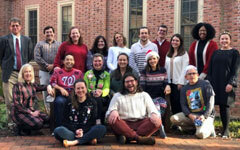 Thank you admissions team for all of your hard work, W&M is typically one of the first schools to let early decision students know, and believe me, we truly appreciate that. Do you have an idea whether we will find out this week or have to wait till next week? Every time I see an email pop up on my phone I instantly grab it-hoping it’s you guys. I second what John said above. You guys have made my life a lot easier; thank you for being so personal and friendly during this whole process. @John and Forrest, once we release decisions we’ll make that information known on our website, social media, this blog, etc. As we’ve mentioned, we don’t usually know until we click “send” that we’ll release when we do. So many moving pieces have to come together for us to make that launch. I agree with John, you guys are working very hard and I too am appreciative. I know that so many people ask you this question, and I am sure you are just as eager to give the results as we are to hear them, but are you guys getting close, still meeting in committees etc? Are you possibly within a few days? Any kind of forecast or status update you can give to us would be much appreciated. Thank you! My daughter is definitely anxious as well, and is very eager to hear back from W&M. Any update you can give on where the office is at processing would be so helpful. Thank you all so much for processing the applications with such urgency! I am so excited to hear decisions and can’t wait to hopefully be at William & Mary next fall. The updates are extremely helpful with coping until the emails are sent out. Any more details about how far along in the process you are would be greatly appreciated! I couldn’t agree more with everyone who has commented above! We are all incredibly in love with William and Mary and I’m sure I’m not the only one who’s thoughts and dreams have been completely consumed by the excitement of the arrival of that email. I have constantly refreshing my inbox in the hopes that it will pop up. Thank you for your continued effort and diligence. We couldn’t be more appreciative. If it wouldn’t be too much, do you think that you guys could give us a ballpark range for around when we will find out? Will it be this week, or should be just hold off completely till next week? I know you guys can’t give us an exact date, but if you guys could provide us with a range, I know that would take a great deal of stress off our back. It’s just that every time my phone buzzes, I think it could be you all. Any hint would help! Thank you so much! Thank you for being transparent in how you go about choosing. It is a fascinating process that seems so secretive and mysterious. It’s nice that you are forthright about what is happening. How many applications can you go through in a day? Are some an easy yes or no or are most applicants discussed at length? @Everyone, we understand that people are anxious to hear back but because there are so many moving parts that have to come together in order for decisions to be launched, there’s really no way to ballpark a release date/time. If we do and we’re late then we get swamped with calls and inquiries that further delay our process. We are working round the clock to move our process forward and believe that our generic release timeline of “early December” is still feasible. Remember, we will let people know that decisions have been released so no need to worry that every incoming email could be from us if there’s no update from us. @Seattle Mom, while in Committee we can generally discuss probably 100 applicants per day (remember they’ve already been read at least twice at that point). Some are lengthy, some are more clear cut as we work our way through the Committee process. There’s no hard and fast time spent on each applicant however. P.S. The existence of this blog alone lowers my anxiety a lot. Holy cow! 100 a day! I feel like I should mail you cookies or something. How great that you take such care with each application and make sure to give each applicant a fair shake. I’m so impressed. @Student and @Seattle Mom, we appreciate the kudos and the praise for the blog and our process. We are equally appreciative of all the great students out there interested in W&M and it’s the least we can do as partners in this process. @MTL, there’s no hard and fast answer to your question but generally, if the readers differ in opinion, the application goes before the entire Committee for a larger conversation and eventual decision. Wow! Okay, thanks for responding so quickly! Oh, one more question… I am applying for financial aid and I have submitted my CSS Profile. I wanted to if my estimate of my financial aid package is going to delay my decision, or are they separate? And if they are separate when will it come in? Sorry for these rapid fire questions… I’m just really anxious. @MTL, the financial aid estimate comes in mid-to-late December, after decisions are released. In fact, the enrollment deposit deadline may be right about the same time given ED applicants apply under the binding ED agreement. Any closer to a decision? Weeks, days, hours? @B.K. Simms, as we mentioned earlier today, there’s really no way to say how far away we are from releasing decisions. They are literally dozens of pieces that need to be completed and brought together in order to launch. And some aren’t under our control. Last March, we were delayed a day or two by an unexpected snowfall. So we don’t try to predict or make promises knowing that a minor delay in even one piece could derail our timeline. Just know that we are working as efficiently and as quickly as possible. It’s only been three weeks and a few days since the ED deadline so please be patient with us just a bit longer. Thank you all so much for your diligent work! I heard from former W&M students that decisions are usually released in the evening, typically after 5 pm. Is this true? @KS, we try to release decisions once the school day ends for most students (regardless of time zone…at least US time zones) although should there be circumstances which suggest releasing at an earlier or later time would be beneficial we could do that. Have you all started looking at the transfer applications yet, or are they left untouched until after the ED decisions have been released? @William and Mary Transfer, the two processes do overlap a little. As we near the end of the ED process we begin the spring transfer process so those applications that are complete are being reviewed. Will you post on this blog before or after you release ED acceptances? And will you post a new blog or comment on this one? Thanks! @MG, once we begin to deploy the decision emails we post a new blog called Decisions, Decisions. That blog outlines how decisions are sent and what decisions are made. We started completing the CSS Profile, but we were waiting to submit until acceptance letters were released. Is there a deadline for completing the CSS Profile. So decision emails are not all sent at once? @JS, the CSS profile deadline for those admitted ED will be December 13 this year. @MG, we release all decisions at the same time but it can take several hours for each and every email to leave our server and arrive at your in-box. So the blog generally goes up once the launch has begun but we always explain that there can be a delay in when that email reaches any particular in-box. My college counselor just submitted my first trimester grades a few days ago, as soon as they were available. I am almost identical to the student described in this blog post (upward grade trends) so I really want you to see my continued success reflected in my best trimester gap to date. Will this recent submission impact my application at all, or have applications already been reviewed? Or is there no way of knowing? Thanks so much from St. Louis, MO. @John Paul, we will be sure to add any materials to your file. Ahh, soo much nervousness within these net few days. I am really anxious to find out! Thank you so Mu @Admit it!, you have definitely made this process so much less stress full! @Dave, our pleasure. We’re working hard to ensure the wait isn’t too much longer. Hey sorry to ask again because I know you keep getting this question and I know you cant make any specific promise because of the possibility for delays, but do you have any idea in when the decisions will come out. Not any specific date but just like in a few days in a week ect. Also do you have any idea on the time you tend to release it like in the morning or afternoon or late night. Thanks and thank you so much for this Blog it is the only thing keeping me sane at this point. @Rachel, we really prefer not to give even an estimate because if we say 3-4 days and it ends up being 6-7, on day 5 we’ll get tons of inquiries as to why decisions weren’t released and that will just slow us down a bit more. As we’ve said all along we believe early December (which is always our general timeline for a release date) is still feasible. Last night there were some comments and responses about time. Just click on the “older comments” link and look at last night’s thread. That will provide some insight there. I really appreciate all the work you guys are doing and your grace when dealing with the stressed masses of people, and I strongly doubt you’ll be able to answer, but does early december mean this weekish or more like next weekish? I only ask because I have some college deadlines approaching and I’m hoping to hear back from WM before paying application fees because, boy, are they hefty! So sorry if this is just another frustrating “when are decisions released” question, I’m just wondering whenaboutish early December becomes mid December. Thanks again for all your patience and hard work, I’m sure it can be stressful for you guys as well as us. @Tilly, we understand your reason for asking but that’s a question we are hesitant to answer. Again, if we say this week and it ends up being next week, our phone line and in-box will be flooded Monday asking about decisions. If we say next week and launch this week people may be equally put off for various reasons. We are as eager to launch decisions as you all are about receiving them so we’re hard at work getting all of our “I”s dotted and “t”s crossed. I’ve read each and every one of the comments on this blog entry as well as a number of others so this shouldn’t be redundant. Is there a way for me to subscribe to this blog or to any sort of service that will notify me when you post a new topic (mainly the Decisions, Decisions…)? If not, I will be compulsively checking all of the given sites until I see something. Thank you so much for all of your hard work and I sincerely hope that this doesn’t ask an already-asked-to-death question once more. Cheers! While I know an exact date can’t be predicted, is it possible to tell us what point in the admissions process the admissions staff is at? I think that might sate some curiosities! 🙂 Thank you!! What does everyone think? Could it come out this evening? It wouldn’t be before 6 or 7 (east coast time). They can do 100 a day and have maybe 1200. So when did they start committee? @Patiently Waiting, that’s hard to say. We’ve reviewed most ED applications but are still getting some newly completed apps each day to review and discuss in Committee. Plus, as Committee concludes we need to print letters, sign them, make admission packets to be mailed, double check decisions, prepare the emails etc. We’re in the middle of all of those steps right now. @Chas, remember, not every application is brought before the Committee. For the most part, we’ve concluded Committee deliberations but have a lot of steps from that point forward to complete. We do not anticipate sending decisions tonight. In my opinion, it will probably not come out for at least two or three days. Assuming they take the same time to review for this year as last year, it shouldn’t come out until the 7th, which is Saturday. See, now that is a lot of good information 🙂 Love you guys/ gals! @B.K. Simms, you’re correct in that we need several days between when Committee ends and when decisions are sent. Exactly how many days that is varies a bit with each application process. There’s no hard and fast rule but yes, we absolutely needs a few days to get everything ready. Do you guys send emails out on the weekend? Or should we just wait until Monday if they don’t make it out by Friday? I tried out the RSS button to subscribe but it only pulls up a blank page and activates Adobe Reader. Now it may be because I’m on a Mac but I can’t imagine that I’m the only one who could encounter this problem. For me, the subscription was but a luxury. I’m telling you so that you know there is a possibility of a problem. If there is and it is fixed, I will certainly subscribe. Until then, thanks so much for the helpful blog and speedy replies! Cheers! @MG, we will have to cross that bridge if and when we come to it. @Hopeful, we just tried the button on a PC and it worked fine. The same button appears on our office’s site (www.wm.edu/admission/undergraduateadmission). You can try it there although we assume you’ll get the same results. We’ll ask our colleagues in IT if this is a MAC issue. When decisions come out, will accepted students automatically be able to access the “accepted discussion boards” I’ve read about? Or will those students need to wait for the admissions packets? @richardulbricht, we have an admitted student website that provides access to discussion boards and much more. That website is hyperlinked in the email admitted students receive and is in the letter they get in the mail. @richardulbricht Oh, your experience was much scarier than mine. I’m going to use a school computer tomorrow and try it. If that doesn’t work, I will just compulsively check the websites for updates. @Hopeful and @Richardulbricht, we’ve forwarded your questions about the RSS feed along to our more technical colleagues and we will hopefully hear from them tomorrow. The RSS feed works with internet explorer but not Google chrome. More rumors floating around, hopefully you can dispel what’s not true! Do W&M acceptance emails really come last? That is, are rejections sent out first and then deferrals and finally, acceptances last? @W&MDad, thanks for the tip. @KS, regardless of how we release decisions, there’s no way to predict how long it takes to go from our server to yours. There are times when students receive their decision email the second we click submit (we actually send copies of the emails to ourselves just as a double check and some students receive their copy before we receive ours which seems impossible). Other students will receive their email hours after we send it. That’s just a function of communicating with so many different email domains and clients. How long do you spend on each personal essay and supplement essay? Also, what percentage of applicants are out of state? Lastly, when would we start making decisions for next year like room and board choices etc. assuming we are accepted? @John Paul, that really depends on the length and quality of the essays but we certainly do our best to review every component of an application including both the personal and supplemental essay if submitted. Overall, about 62-64% of our applicants are out-of-state. Students who are admitted get information beginning in May about dining plans, room assignments, etc. Thanks so much! Eager to hear back, we appreciate all of you and your office’s hard work! I can’t thank you enough for this blog and the fact that you actually answer comments in a timely manner. Admit it goes beyond the call of duty. Thanks, and I can’t wait for the decision! @John Paul and @AEW, it’s truly our pleasure. While a large part of our job is to make admission decisions, another large part is to serve as counselors to those going through this process. We take delight in and give serious consideration to both of those hats that we wear. Thank you so much for this blog! I know it doesn’t really apply to tonight, but I wanted to share a little something I worked on while trying to calm my nerves. Students’ eyes were fixed on their emails with no inclination to roam. In hopes that acceptance letters soon would be there. All while visions of green, gold, and silver flashed in their heads. @Hopeful Class of 2018, that’s great. We actually send an email with a similar theme to prospective applicants in December. Great minds and all that! @MP, it’s truly our pleasure. We’re glad that this blog helps ease some of the anxiety we know you all are feeling. Yesterday it was really easing when you commented and said that it was not likely that letters would be released. Is there any way you could make a prediction for today? @MG, we don’t expect to release decisions today either. I would say after today it’s very day to day so we may not be able to make predictions beyond today. I know, I know, Wikipedia is not the font of all knowledge but I doubt that their page on what an RSS reader is too far off. Do you release decisions on Saturday? @Ci, sorry if you missed this (there are nearly 100 comments on this post), but there was some earlier discussion on this point. We’ll cross the “weekend” bridge if and when we come to it. We don’t have a hard and fast policy about days we do and do not release decisions. I know this has been said time and time before, but I feel a huge thank you is in order towards the admissions committee for not only their diligent work on our applications but also the time and effort they put into this blog. Just reading their responses to the comments on here has much of my stress relieved. Although my nerves are running high with the upcoming release of decisions, I feel much more calm than I expected to feel and I can’t find the words to express my gratitude for all of this. Thank you, thank you, thank you! I truly hope for the privelge of joining the Tribe. will transfer decisions be released around the same time as ED? @Phil, no they aren’t. Once we finish ED, that’s when we launch in to transfer Committee. So while there’s not a huge gap between when we release ED and when we release transfers, it’s usually a week to 10 days between the two launch dates. Today I learned that a large group of people from my school applied Early Decision to William and Mary and I am concerned about how that affects my chances at getting accepted. Is there a limit on the number of people you accept from one school? Concerned student, I have heard that too. Their are many people who think that W & M can only accept so many students from one area. I don’t think its true, but I would like to clarify that too!. I know this was touched on yesterday, but could you provide an update on what stage the admissions process is in? Like has committee ended for those with newly completed applications? I have grey hair waiting! I’ve probably checked my email 150 times today! This blog as well as the comments relieve some of the stress but I can’t wait! This will be (hopefully if the decision is an acceptance) the best Christmas present ever! Thank you for working hard to get the decisions made. I’ve got my green and gold prepared to wear to school if I hear good news! I have one quick question. Are you also extending the deadline for the CSS profile since ED has been extended? @Concerned Student and @Chas, the only “quota” we have is 65% in-state students, 35% out-of-state students. Other than that there’s no specific cut-offs per state, per city, per school, etc. If 20 students apply from your school and all are fabulous, we’ll admit them all. If 20 students apply from your school and none are competitive, we won’t admit any. So no need to worry that your chances are diminished by having your classmates apply. @W&M Hopeful, we’re in that stag that’s a mix of all stages. We’re reviewing newly completed applicants, finalizing decisions, printing letters, preparing emails, double checking decisions, etc. We’re definitely on the tail end but many many steps are still in progress. @Mari, we extended the CSS Profile deadline to Dec. 13 back when we extended the application deadline. Remember however you can submit your CSS profile at any time and don’t need any admission decision to do so. @Elizabeth, no grey hairs please. Just check for our Decisions, Decisions blog once each day. When you see it you’ll know to check your in-box. Thank you for the quick response! This blog has been so helpful over the past few weeks! I’m feeling it, I think the release date is gonna be either today or tomorrow. Predictions, anyone? My guess is Friday, 7pm ET. @B.K. Simms, hopefully as the time stamps on these comments show we’re working round the clock right now. That being said, while there’s no hard and fast cut-off time, we wouldn’t release decisions at 11:00pm or midnight or anything like that. For everyone who’s anxious, just remember, check this blog maybe once in the morning and once in the evening for the new Decisions, Decisions blog which will be your queue that decisions have been released. Any predictions for today, per chance? Does the office work on Saturdays and Sundays too? Or if it comes to then will it be sent out the following business days? @Renny, as we said yesterday we won’t be able to give any additional forecasts. As we get towards the very end of our process it’s very much day-to-day but remember, just look for the Decisions blog as your queue. @George, some of the previous comments and responses address your question. As we’ve said, we will cross that bridge if and when we come to it. @Readers, we know there are A LOT of comments already on this blog to sort through but we encourage everyone to review them. There’s some great information out there already that answers many of your questions. Will you guys be writing another blog post for transfer students? @William and Mary Transfer, yes. We do the Overheard in Committee Blog and Decisions Blog for transfers when those times come. Thanks again for your hard work and patience, it is so much appreciated! So what constitutes “middle” December? When does “early” December end? @Rick Jarvis, not sure there’s a distinctive line but probably safe to assume that early December applies to days prior to 12/10. @JKR, can’t really answer that. It would certainly be our goal to start before then but once we start it can take several hours to send out all emails and even longer sometimes for them to be received by your email server. In previous years, our network has gone down in the middle of sending decisions so we really don’t place time parameters on it since it’s beyond our control and not an exact science. Just out of curiosity, how many students applied for ED this year? @MG, a little over 1200 students applied. So up a little bit from previous years. I know that you guys have already told us that the decisions are hopefully being released before the weekend, but any news on if some will go out tonight. The anticipation is killing me! So if the blog will say when decisions have been sent out is it safe to assume that if the blog has not posted that decisions have been sent by around 8 pm then they will not be going out that day? @LG96 the anticipation is killing me too! Numerous family members have called asking if I got in. I think we should all go help the admissions office finish. That’ll speed up the process! Hi – thanks for all of your hard work! Out of curiosity, how many students applied for spring transfer this year? Are there a lot of transfer spots that will be going to students in the community college programs this year? Thank you. I agree! And the anticipation is killing all of us, but they’re working as fast as they can. I thought maybe around 4 we could ask if they made progress, and if they had any more information. Earlier I was trying to ask the same question as @RS. @LG96, we actually haven’t said that decisions will be released this weekend. We are certainly working to get them out sooner rather than later. We still think early December (our general timeline) is doable but can’t make any predictions beyond that. @RS, there are no hard and fast answers there. We definitely wouldn’t begin a launch at say 11:00pm or later but we have launched in the evening hours in previous years. @Cathy, we’re still processing transfer applications but our numbers look to be on par with previous spring transfer application processes. And no particular number of spots are reserved for community college students. We do have agreements with VA community colleges (we are all state institutions) but there’s no quota for those students vs other transfer applicants. @B.K., yesterday was the last day we felt comfortable saying not tonight. That doesn’t mean people should assume they’re coming out tonight. Just know that we are absolutely in the last stages of our ED process and working as efficiently as we can (while still maintaining a strong process) to get the process concluded. So your processing your processes to process the processed applications as part of a processing process for your process? I just hope that @Admit It isn’t needed by the committee – poor person has no time to get any real work done!! Terrific information with these blog entries and comments. Thank you. 1. What comes first the decisions being released or the “Decisions Decisions” blog being available? My concern is not seeing the Decisions blog but people posting comments in this forum that they received their decision. 2. For those students who are “deferred”, is anything provided in the decision email of how they can make a stronger package for regular decision acceptance? If not, is a W&M Admissions representative available to provide feedback in creating a stronger package? @richardulbricht, we are normally not a fan of using the same word over and over in a sentence but in blogging, as in life, brevity is the soul of wit right? (We admit we’ve likely run out of wit at this point in the “process” — haha). @BS, generally the blog is posted as decisions begin to leave our servers. The blog is very detailed and explains that its posting by no means conveys all decisions are in their respective in-boxes but that they are in progress. The blog also explains the steps we encourage deferred students to take to follow up and explains why defer decisions are often made. If students have additional questions, they can of course reach out to us. @B.K., we begin review of applicants once their files are complete and ready for review. Generally for ED, even if applications are turned in before the deadline, we don’t begin reading until the end of October/early November. That held true this year even with the extended deadline. So I know that you can’t tell us “Not tonight” but any further progress today? Is it getting close? This may or may have not been mentioned before, but for a direct answer, what is the absolute latest at night and absolute earliest in the morning you would send out decisions on a given day? Thank you so much for your cooperation and dedication to the future class of 2018! We love you! Hopeful, admit it said that there is no set time of when, but 11pm and later they won’t send them out. Thanks B.K! You think it’ll be tonight? @Jackson, we’re making good progress but we never are 100% confident we’re ready to release until the moment is upon us. Just watch for the new blog post and that will be your queue. @hopeful, B.K. addressed part of your question. And as we mentioned in an earlier response, we generally try to send decisions during non-school hours so mornings are unlikely. Ooh I wonder when the office shuts down for the night. I think it will be tonight, I’m feeling it. @onlyfreakingoutalittle: this is the blog they are talking about . . .
@onlyfreakingoutalittle You may be referring to “Decisions, Decisions”. It’s not been posted yet so we have to keep searching for it. @OnlyFreakingOutaLittle and @w&mmom, we’re a bit confused as to which blog you’re referring to but basically, when decisions are released, we will post a Decisions, Decisions blog (we post several a year — ED, Spring Transfer, RD, Fall Transfer so old ones are searchable and easily found on the blog). That blog for this ED process hasn’t yet been posted since we haven’t released decisions. When that blog is the first blog on the Admit It! Blog site you’ll know decisions are being released. Thanks! I thought Decisions, Decisions was a whole separate blog that was not attached to Admit It! Thanks for clarifying! Just out of curiousity, how late do you work, and do you work on the weekends? My whole family has this blog open up on their smart phones, and computers and checks hourly! It’s so helpful! Thanks for your quick answers!! @OnlyFreakingOutaLittle, no problem. Sorry that wasn’t clear. !Hopefulw&mTwin, we addressed these earlier today we think (or maybe yesterday…there’s been a lot of chatter!). We work pretty late as we prepare to wrap up application review but there’s no hard and fast quitting time. As we mentioned, we won’t release decisions once it gets to 11:00pm, midnight, etc. And we often work on weekends. If you’re asking would we release decisions on a weekend, as we’ve mentioned, we’ll cross that bridge if we come to it. @Grandma, that just warmed the hearts of those of us still plugging away in the office tonight! If you’re still working, does that mean that there’s a possibility of a decision tonight? My fingers are crossed!! Would love to bring you all some homemade chicken soup. @Grandma, you sound like a wonderful person. Wow! You guys are amazing!! No matter what my email says, I’m so grateful that you put so much time and effort into our applications. It is wonderful to know how much you really care. Couldn’t agree more. Sounds a lot like all my friends and family praying and refreshing their browsers constantly. There are hundreds of us cheering you on admissions staff, you’ve got this! We’re all cheering you on! Your efforts are amazing . Take the time you need and keep chugging along, thanks for the outstanding attention you guys give to each and every one of us. Thank you everyone for all the good thoughts and good wishes. While we are anxious to get you your decisions but we will ensure our, as @Megan mentions, that we take all the time necessary to ensure the integrity of our process. So do you guys think there is any chance it could be tonight or should I go to sleep? I’m so excited! I was wondering the same thing @Tilly! I wonder whether they are at a place at which they could tell us if tonight is still feasible. Ahhh, so on edge! I know there are hundreds of us constantly refreshing this webpage. I hope they would still send at 10. I know we will still be checking until 11 comes around! @Tilly, @Aussie, many people who applied ED are wondering the same thing. W&M already posted multiple times tonight on this blog that decisions could be released tonight, or tomorrow night, or some time in the near future past then. Just chill out. The release of the decisions won’t change whether you got in or not. That’s already been determined. @B lol “chill out” This is one of the most important decisions of our lives. 13 years of schooling as lead to this email and whether or not it says accepted, deferred or denied. I think we have a right to freak out. Obviously as Early Decision applicants we want this a lot. And also, if all the decisions were made and set in stone, they would have sent them already. Obviously some people are still being reviewed. Y’all, the Tribe is supportive and our interactions with each other while we wait to hear should be too. Let’s keep this board encouraging and respectful. Just wanna wish good luck to everyone stalking the comments right now! The decisions could come now or tomorrow or next week, but either way, I hope for the best for all. @B and @A, Haha, I’m not freaking out I just genuinely want to go to sleep! It’s awesome that the admissions office is so thorough and helpful though. Not going to lie- I have been refreshing this page all day to read comments- even though they all sort of say the same thing, it’s still comforting to know I’m not the only one freaking out, wondering if my 12 years of hard work will all be rewarded! Best of luck to everyone! I wish all of us EDs could get accepted! @Everyone, guys don’t worry, trust me I’ve been refreshing this page for like 72 hours but the fact is, the decisions are probably sitting somewhere in a file waiting to be sent out over the next couple of days, and no amount of worrying will change what that file says. I know it’s hard, but trust that all will work out for the best in the end. Try making a cup of tea, and then reading or starting a new tv series or go take a walk. Its really nice to take our minds off of this blog and what the future will hold even just for a few minutes to stay sane. I wish you all good luck, and please wish the same for me. @John Paul Austin That’s good advice! I do wish the same for you. I bet it will be the next couple days. I couldn’t agree more with the past few comments! I am just as anxious as every other applicant but we shouldn’t be complaining about when decisions come out. The admissions office is already working as hard as they can. Personally, I would rather wait longer but know that my application was carefully looked over so THANK YOU W&M admissions office! Good luck to everyone! I have been refreshing and watching this blog post since I got home from school, it is nice to see I am not the only one going crazy waiting. No matter what you are all highly intelligent and wonderful people, but all the same I hope fate in on our sides for this one! @Tilly and @Aussie, given it’s close to 10:00pm and no new blog, it’s safe to go to sleep or do homework or relax and make that cup of tea @John Paul Austin mentioned. To ensure we conclude this process well even we need to get a little sleep. @Everyone, remember that are what feels like a million and one steps once Committee concludes to complete in order to release decisions. We’ve mentioned a number of those steps in these comments and that’s what we’re working on. @A and @Elizabeth, we understand how much this decisions means to you. But be it good or bad, please know that all you’ve accomplished and worked hard for these past 12-13 years is itself the reward. An admission decision, especially one that’s not an admission offer, does not detract from any of that hard work or anything you’ve accomplished. Thank you everyone for your patience and for the reassurance you are all giving to each other. This is a time for us all to stay positive. This wait is slowly killing me inside…. I had a cup of tea, and I’m trying to watch The Sound of Music, but my face is glued to my iPad. Ugh this is frustrating. This blog is helping a little but I think I’ll be up all night again. I know you guys are working really hard and I give you props for working so late and I greatly appreciate it. 🙂 I just needed to vent a little. Thanks again for having this blog! Wow @Admit It you are fantastic. Thanks for all of the updates. @KS you are so right. Go Tribe! @Dying, we think maybe our inference in our last post was too subtle. We told @Tilly she could go to sleep. Given there’s no Decisions blog you don’t need to stay up further tonight. We will not be releasing decisions today. @AndrewC, we generally release transfer decisions in mid-December and we think that timeline is still accurate. Just like with ED, we cannot give a more definitive timeline or date. There’s always some housing for spring transfers but it is usually somewhat limited. Those admitted will get more information. @Hopeful freshman, the wait while we understand feels like forever, really isn’t so bad. Remember, it’s not yet even been a month since our extended deadline. Again, we ask for your continued patience. You can of course continue with your social and other activities. When decisions are released they’ll be in your in-box whether you’re reading a book, eating dinner or at a school sporting event! I feel like the decisions are approaching. Any day now! I’m so excited! I wish I could be at Williiam and Mary right now. I miss everything about it. I have a snow day today, and getting into WM would officially make it the best day ever! If decisions were to be released today, would they be sent out after school in all time zones? @MG, we do our best to not interrupt a school day with releasing decisions but keep in mind that we have applicants from all over the world so if we release on a weekday we’re likely to hit someone’s in-box during school hours. Thank you so much for this blog and all your hard work to try and get decisions out! I’m sure everyone appreciates your efforts. I was just wondering if you had to have all decisions made before you emailed out letters. If people are missing components will they be given decisions later or do you have to release them all together? Thank you! @Taruni, we do our best to complete all applications and the review thereof before sending decisions but once we get to the point where there are only a few lingering incomplete applications, we will release decisions to all but those who are incomplete. We will not keep the majority waiting for the small minority who remain incomplete. Good luck everyone, it’s obvious that decisions are coming out really soon. Not to worried accepted or denied but for those of you praying for this I hope you get it. And thank you to the @Admit It staff of contributors for answering our multitude of questions as we come down to the wire. Your collective support and tireless patience, as you address the same questions over and over, are greatly and truly appreciated! So is today the day? @Wondering, as we’ve said, we won’t set a specific release date/time until we’re actually under way. If we say a date/time and something goes wrong and delays the launch we’ll be flooded with calls about why decisions aren’t available an that will just impede our progress further. We know you’re anxious to hear but we really appreciate everyone’s continued patience. It’s still been less than a month since the application deadline. Great job Admit It! Only thing I don’t understand is in the past you’ve said that you have to get all of the packages and other things together prior to sending out emails. If that is true I can’t help but wonder why? Most kids don’t care if the mail packet arrives in 2 days or 2 weeks, as long as they get the email!! @AnxiousDad, that’s just one of literally dozens of steps we’re in the middle of as we prepare to release decisions. There are several steps related to the emails themselves. Additionally, having the letters/packets is a back-up method of delivering the decision should the email not get received for any reason so we want to have that in place to not keep students waiting any longer than necessary. @Admit It, that sounds like it will NOT be today. Sigh. @Vahockey, many of these steps are very close to their conclusion. We’re working as hard and fast as we can to get decisions released. Hang with us. So this evening is an actual possibility? @MG, as we said on Wednesday, we’re getting very close to the end and have to take it one day at a time from here on out. So everything from then forward was/is a possibility but we can’t make any timeline predictions beyond that. Great job keeping info flowing, Admit it! I think the Common App, blogs, and email notification are much better than “back in my day” applying and being accepted to W&M in the early 1980s (typing and mailing each application separately, no instant confirmation of receipt), but wonder what today’s applicants would have thought about our once-a-day run out to the mailbox to see if our decision letter was “finally there” – and whether it was a “thick” or “thin” letter! @W&M Alum, we’ve only been emailing decisions for about three years now so the days of checking the mailbox aren’t long forgotten. @W&M Alum, great point and I remember those days well, although I’ve also taken to hourly refreshes of this blog. Hopefully, decisions will be sent before the IT police come searching for the employee with a sudden obsession for Admit It! Sorry to sound so anxious! We all know how hard you guys are working and sincerely appreciate all of the feedback especially given the compressed schedule this year. I do think it would be helpful, however, to say not today, if that is the case. I understand you can’t predict at what point you will be ready to release decisions as there are so many moving parts. I am staying positive and wishing the best for all the applicants! @Vahockey, understood and we did finally do that late last night even though we said we weren’t going to be able to make those statements after Wednesday. At this point though we’d really appreciate patience and let us avoid making any predictions one way or the other given how close we are to the end. Thank you, truly, for everything you do. Please know that we all appreciate it fully. Same! I feel the need to thank you guys. It is quite nerve racking knowing it could be any minute… But you guys work so hard and are just as excited as us! This blog is the only thing keeping me sane at this point. Thank you Admit it! and everyone working in admissions! He’s serious. I got it as well. Are we thinking tonight guys? Just so nervous that I cant take it anymore! Can anyone from Admit It confirm that decisions have been sent? I got a rejection letter but there’s no Decisions blog. ahhh! the suspense is killing meeeee!! @abbey you too!! Has anyone else gotten emails? Sweet I got a full ride for Quidditch!! what is the “decisions blog”? @X for real!! thats sick! No I’m just joking Hannah 🙂 no email yet! Very excited though. Apparently right before decisions are sent, WM posts a “Decisions, decisions…” titled blog. Few people are getting rejections yet no blog. Wondering why that is. @richardulbricht I thought these were just rumors..? @Admit it, please confirm if emails are indeed being sent or if there are individuals who are being mean-spirited and posting untrue information. My daughter has not posted asking the repeated question whether or not decisions have been sent out of respect for the hard-working Admissions Team, but now is very upset seeing the blog posts. This should be an exciting time for all students. Again, please confirm. I think Admit It mentioned earlier that they actually post the blog as they send out the first letters, so they might just be have underestimated the speed of their servers. @Readers, we are busy getting decision launch underway and will post the Decisions blog in a bit. Yes, decisions are in the process of being sent, slowly but surely. @Emily, you should definitely double check for the email saying everything is complete or email follow ups from us letting you know what you’re missing. Check spam and junk folders. You won’t get a decision if your application is incomplete. @B and @richardulbricht, we are sorry that the news couldn’t be more positive. I’m freaking out but I trust that admit it will post a blog before decisions are sent out. Richardfullbright what did it say? Anyone else heard? Yeah I don’t think so bud. @concernedmom Admit it has not posted anything on here in quite a while, so im guessing these are all rumors…but yes we are all very nervous. It’s no problem Admit It. Thank you for helping guide us through this process. I know my downsides, thanks for considering me. @Concerned Mom and @Hannah, we posted just a few minutes ago a comment confirming that decisions are being sent and we’re focusing on that and will post the blog while in progress just as @Arun alluded to. Richard I’m sorry. I’m thinking of you man, I wish you the best. @Admit it, thank you for responding, I guess I should have been more clear…I did email admissions to ensure that my file was complete and they responded saying that it was and I must have somehow missed the email. I was just worrying that because I didn’t get that email, I might not be on a mailing list or something of the sort! Did they send rejections out first? @Emily, if you got the initial email from us then it would seem our email server can communicate with yours but be sure to check spam and junk folders. @Hannah I couldn’t agree more! Thanks John. Luckily Pittsburgh already accepted me in rolling. Maybe Emory will have better news. Wish all of you the best of luck. I can’t be the only one pressing F5 every 3 seconds. Hello, I am in the same situation as the Emily above. I received the first email and not the second, and also emailed the admissions committee. But it was not ever confirmed that my application was complete. Will I receive a decision? @Another Emily, who did you email at the admission committee? We respond to our email every business day and would have gotten back to you. If your application is complete you should get a decision email. If it’s not, you won’t. Another great computer tip: If you’re using Google Chrome, and you accidentally close a tab, just press Ctrl + Shift + T and the tab will re-open! Wow! Thank you so much! Does Firefox have something similar? @admit it is there any particular order? Just wondering, thank you! I emailed the admission officer for my region (Massachusetts/ New England). I never received anything saying I was incomplete either, so is it likely just an accident that the email never arrived in my inbox? @Another Emily, not sure why you didn’t get a response. Wondering if your email never got to Dean Gershowitz. Likely just a cyber glitch but if you don’t get a decision you can follow up with us on Monday. That info will be in the Decisions blog to be posted momentarily. How do I get to this “decisions blog”?? @diffHannah The decisions blog hasn’t been published yet! When it is, it will be here I think. Oh, you didn’t get the password? @diffhannah, it was just posted! It has just been published!!! Wow. Rejected from my favorite school. What a terrible Christmas present. Congrats to those who got in- I know how excited you must be. @Crying, we are so sorry that the news couldn’t be better. We know how disappointed and upset you must feel. We do wish you all the best as you pursue other colleges and universities and know you will find a great fit for the next four years. I know you said that it can take a few hours to get the email, but can you say if you’ve finished sending out all of the emails? @OnlyFreakingOutaLittle, we just posted that information on the Decisions, Decisions blog.